Now here's a happy snap! The First Post's Daily Beast feature has just the thing to send you smiling into the weekend. 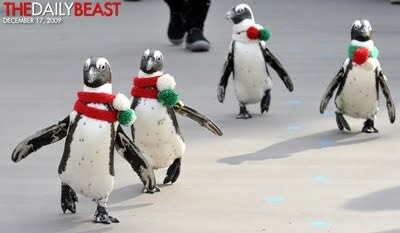 Cape penguins sporting knitted red scarves with green and white pom-poms for the holidays. By the way, my Super Cupcake cowl is all done and the matching hat is on the needles. More on this terrific looking duo next week, once the fat lady binds off. When I was in my early teens, my friends and I would go downtown to the movies. Any remaining money we had would be pooled to buy munchies and drinks at the corner snack shop. I always remembered this place because it was a remnant of a bygone era, with its huge neon sign above the door in cotton candy colors, surrounded by blinking marquee lights proclaiming "17." 4. Repeat 2 and 3 until piece measures 36" / 92 cm, ending with CC row at RS edge. 5. Pick up MC and continue for another 14" / 36 cm. Bind off and weave in ends. You'll end up with a petite scarf that is two-thirds subtle stripe and one-third softly variegated (or solid, depending on the yarn you choose). By the way, Rocky's first turn on the granite catwalk lasted an entire 3 seconds. Harrumph! No cat pants for you! 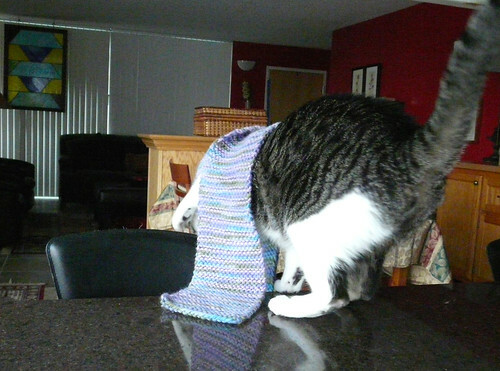 *Thanks to Monica for the suggestion that Rocky needed a scarf and to domesticat's crew for showing him how it's done. Modifications: 11 triangles instead of 16 called for in pattern yielded a 68" scarf, unblocked. This is my first foray into working with hemp and it won't be the last. 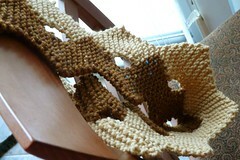 As mentioned, I did not block the scarf because it seems to have maintained its rounded, organic shape. I'm told by those who know such things that the fiber will soften with washing. It's already kind of soft - at least as far as hemp goes. According to the yarn store owner, that softness and subtle sheen is why it is considered "luxury" hemp. Someone on Ravelry likened it to buying jeans that are already broken in. 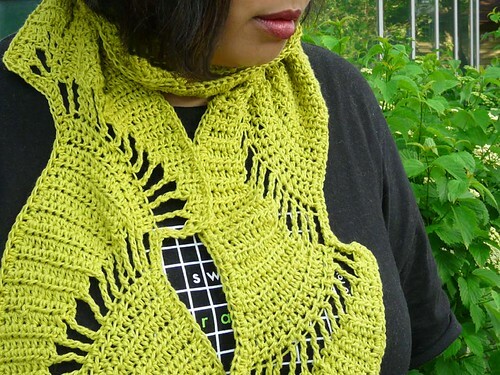 I'm toying with using one of these two patterns for the birthday yarn: Eva's Shawl or Crocus Bud Shawl. Yes, I'm still in the crochet mood. I just found out that I've been approved for one of the intensive pain management therapy programs at the Rehabilitation Institute of Chicago. I'm hoping this will ease the pain enough for me to knit once again. Oh, and one more thing. My cousin Simone will be going to the Olympics in Beijing as part of the USA women's basketball team. Pretty cool, eh? 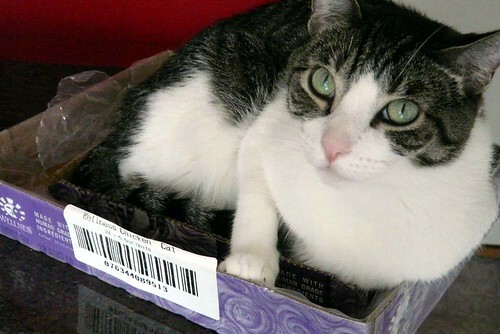 A box of cat. Formerly, a box of cat food. I tried knitting a little bit. You know, just to test the shoulder stamina. Bad idea. I can't keep my hands still though, so I found an attractive, simple pattern and some surprisingly soft hemp yarn and kicked things off with a 15-stitch chain. Just a reminder for those who have not yet entered: I am giving away FREE YARN for my birthday! All you need do is post a 5/7/5 English-style haiku in the 'Comments' section by midnight (CT) May 30, 2008. I'll select 3 random poets to receive goodies from my stash. At its most basic, that's all knitting really is, isn't it? Loops over loops. Only when we apply these under-over-through actions to the loops in a consistent, uniform way do we begin to see the loops build upon one another into a cohesive fabric. This is something that has fascinated me of late. Just how differently designing for knitting varies from creating patterns for sewing which you then apply to fabric. Of course, there are similarities of terminology, measurement and fit. But with knitting, you are simultaneously creating the fabric and the garment with all the requisite constraints of sizing and fit. Pretty freaking cool if you ask me. All from something as simple as loops over loops. I delayed posting the finished Foliage hat in Malabrigo's Velvet Grapes worsted because I just couldn't decide on what to do with the 1.5 skeins of yarn I had left. The hat is a quick knit, even for me, taking only 4 days from start to finish. I hesitated on making a scarf since the temps are starting to hint at Spring in the Midwest. But I'm like, "Heck. It's wool. I'll need a scarf at some point." After the flipping through Ravelry, a couple of books and a giant box of patterns, I dipped into the Knitty archive once again and cast on for Argosy. It sort of looks like entrelac or modular knitting but it's really just loops over loops, turned counter-clockwise 45 degrees. No diamonds. No leaves. Just a little ol' patterned stockinette and garter that fascinates my visual mind. If it's not one thing, it's another. There will be a slight break in the fiber action, so please forgive me. For reasons of either medication or stress, my hands have broken out in a kind of rash. The topical treatment consists of cortisone cream and cotton gloves and avoiding wool and doing the dishes until the symptoms subside. The only part I like is not doing the dishes. Here's wishing you a relaxing weekend! Those of you who maintain a blog can hopefully relate to the real or imagined pressure to "feed the monster." I am absolutely in awe of those craft bloggers who have something to say - and seemingly a new project to show - nearly every day. How do they do it? Makes me feel as though I'm somehow inadequate. Eh, well. Perhaps, these be my issues alone. As I was going to say, in an effort to keep you visiting my outpost, I figured I needed a hat, stat! Something quick, beautiful and useful. 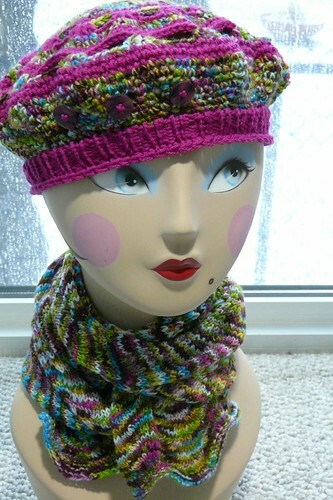 That's why I turned to my size K crochet hook and some chunky stash yarn to produce this lovely, glamorous duo. 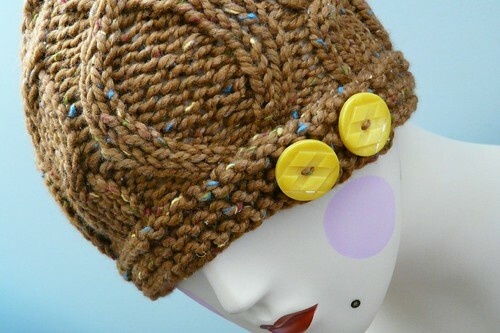 The hat pattern is based on my own recipe for top-down crochet hats. One day, I may write it down. It's just something I've been using ever since I figured out how to crochet when I was still in the single digits. Next, I tacked on a vertical shell-like stitch called Twig from The Crochet Stitch Bible, page 81. The scarflet or neckwarmer is straight Twig for 17 or so inches, then I do a kind of short-row to extend the right side a bit. Sew on a couple of appropriately-sized buttons on the left side and there you have it: Easy Glamour in less than two days. FO: Let's Make A Deal! I was determined not to do it. After all, it's something that I'd avoided for at least 3 or 4 years but this time was different. This time, the cold winds got the best of my usually overly-warm radiant heating system. This time, I found myself wearing three layers and two pairs of socks to bed. Friends, it was time to turn on the heat! I also found myself longing to start a new pair of socks. The only way I would concede defeat to the weather and my "new sock" desires? I had to finish at least one WIP. 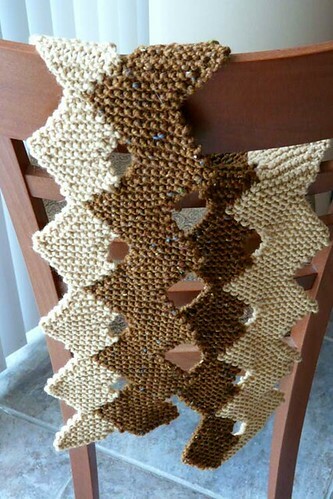 I chose the ZigZag Scarf from "Knitting New Scarves". Finished dimensions 6" x 58"
The most complicated thing about this scarf was the intarsia, or color-block knitting. 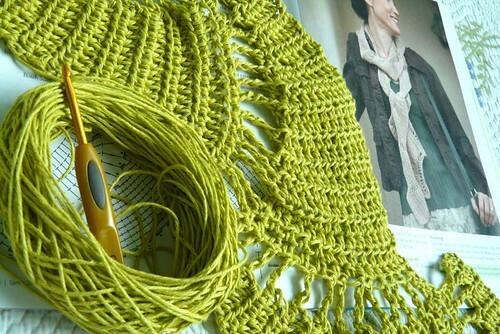 As you know, with any multi-skein technique, there is a tendency for yarn and knitting to get tangled around one another - even if you carefully twist one yarn under and over the other as you carry it along. As the scarf got longer, I threw it over my left shoulder to keep it out of the way. I also tried to remember to turn my work only one of two ways as I worked right and wrong side rows. Not perfect, but it really did help minimize the twist-up. Will I knit this pattern again? Oh, it's quite likely I will. Part of the fun of this is picking interesting color pairs and watching them intertwine with one another. I said something about a sock, didn't I. I'm calling it Chewy Monkey. Relax. It's the "everybody's-done-at-least-one" Monkey, knitting up quite beautifully in Chewy Spaghetti sock yarn. Yum! A new year and new yarn to play with, so what do I do? 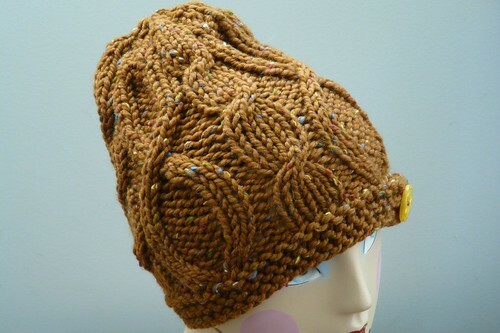 Knock out my version of the Yarn Harlot's Unoriginal Hat Pattern (PDF) in less than 2 days. Even with chunky yarn and big needles, that still amuses me. Once I completed the pattern as written, I picked up 56 stitches around the bottom of the hat. 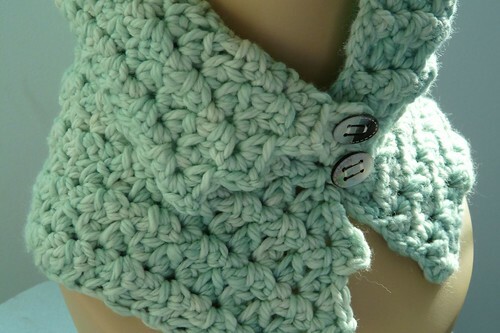 Next, I used the cable cast on method to add 8 stitches to create a tab extension for the buttons. I knit this add-on flat instead of circular so that I'd end up with an easy 5 row garter band. What's a hat without a scarf, I ask you? Just a lonely little soldier. 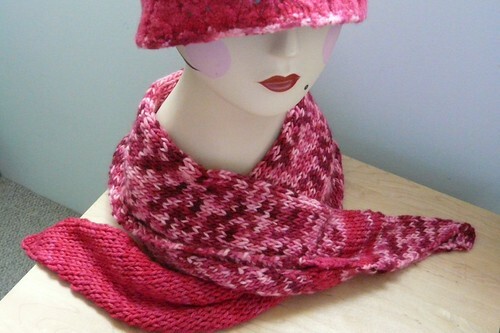 Enter Lynne Barr's "Knitting New Scarves" and the ZigZag scarf pattern (page 122). 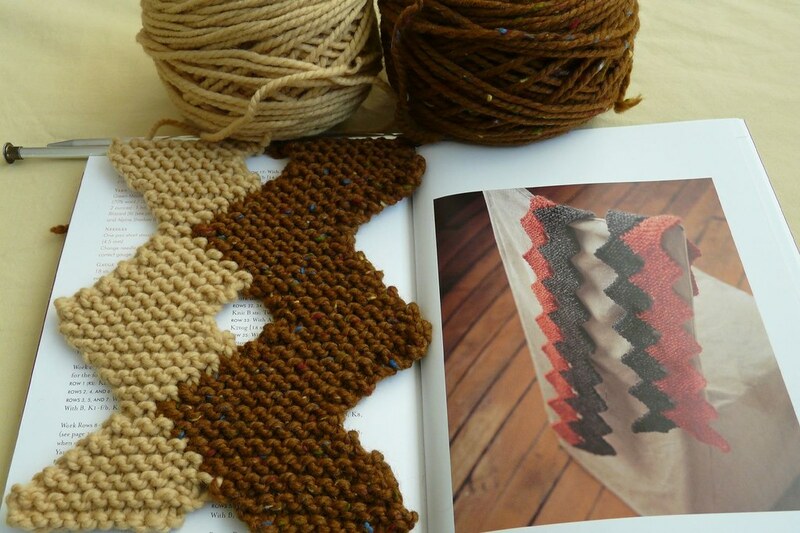 I'm only 3 repeats into it, but it is very easy and serves as a wonderful introduction to intarsia. What an intriguing collection of scarves that ventures far beyond the basic elongated rectangle. I strongly suggest this book be added to your knit reading list. So many other temptations in store. What should I tackle next? 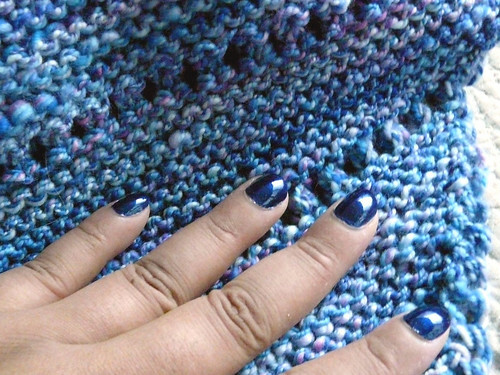 Blue Sky Alpaca's Suri Merino fingerless mitts or a felted Malabrigo handbag? Oh, yeah. There are a few new designs brewing as well. My crystal ball says '08 will be a busy, busy year! You see where this is headed, don't you? Nothing big. Just a ripping good time (not) as I decide that the black and blue scarf wasn't coming along as nicely as I wanted. The edges looked ragged and the first row uneven. No matter how much lipstick gets put on a pig, it's still a pig. No offense to pigs, of course. With time running a mite on the short side, I'm going to start over, double-stranding the RYC Cashsoft 4-ply to do Norah Gaughan's Almost Garter scarf with alternating black and navy blue rows. Yes, I have a knitting angel and her name is Angie. There's been a bit of blog chatter lately about paying it forward or random acts of kindness. I think it only fair that I put Angie's name out there as someone who did a me kindness by offering - no, insisting that she finish knitting my Last Minute Knitted Gifts chevron scarf for me. Anyone who's read my screed long enough knows that I have the right shoulder from hell. When it will flare up, no one knows. Through private correspondence, Angie and I came to terms: she wanted nothing; I insisted on, at least, a token of my appreciation in return for her knitting this scarf that has nothing "last minute" about it! Sock yarn for a 6 foot scarf? But she persevered, sending me the scarf a couple of weeks ago. It is so lovely that I decided a matching hat was in order, so I made up a crochet beret with three little purple buttons on the front. What better way to spend a snowy day in Chicago? Thank you, Angie. 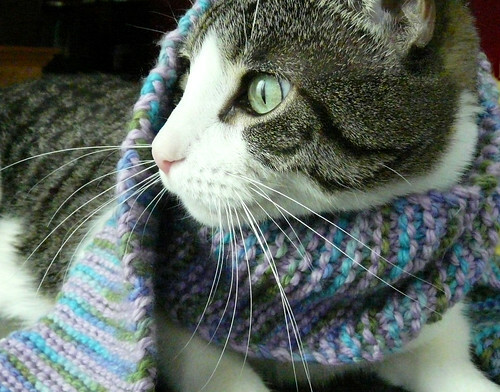 ETA: The yarns used for the scarf are Scout's "Harlot's Mums" and Sunshine Yarns' "Dragonfly." 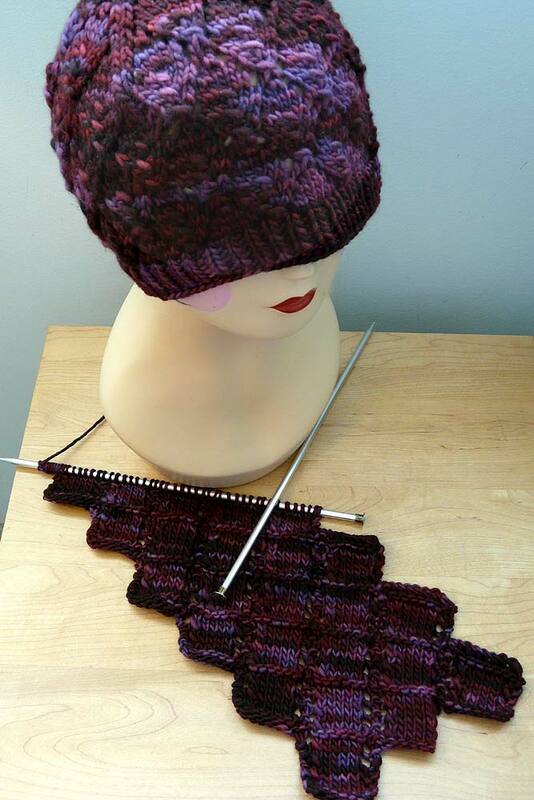 The mini beret uses both of those (double-stranded) plus RYC Cashsoft in fuchsia for a solid punch of color. Now let's see if I can't help out another Karen. She's having some trouble with her hands and wrists, making knitting next to impossible for her right now. She recently wished for a knitting angel of her own. Any more big hearts out there willing to help? I never talked about it but I've been working on this scarf / wrap thing all along. You see, I didn't want the Felted Foliage hat to out into the world without a partner, so I made a diamond-shaped scarf to keep it company using a very simple stockinette pattern. 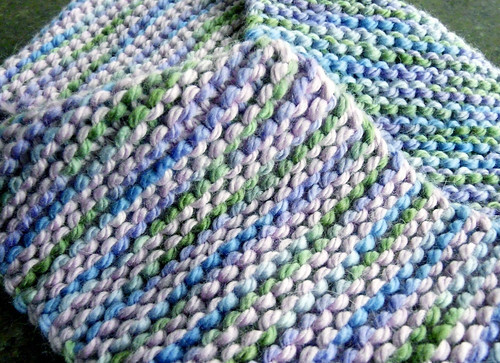 Knit into front and back (kfb) of first and last stitch of each right side (RS) row. Purl each wrong side (WS) row. Continue the RS increases until your knitted fabric is 34" wide. Purl back, then begin decrease. On RS, slip slip knit (ssk) the first 2 stitches then knit to last 2 stitches, knitting them together (k2tog). 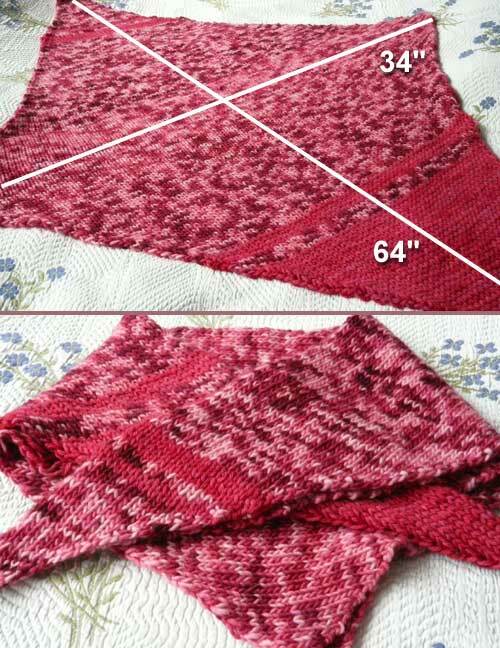 Continue the RS decreases until your knitted fabric is 64" long and 3 stitches remain. Purl back, then bind off (BO) remaining stitches. 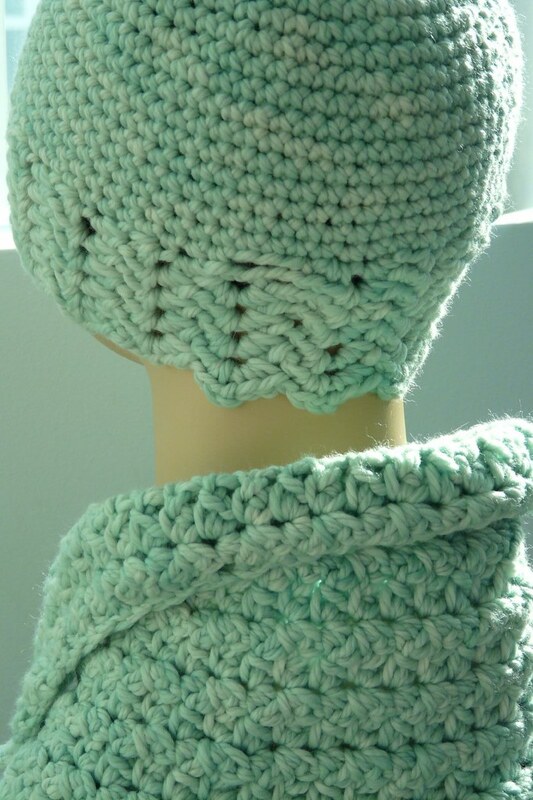 Since the beginning and ending stitches are doubled or halved, there is only minimal curling of the edges of this pretty wrap. All that's left on the holiday knitting list is a neckwarmer (50% complete), a scarf (just getting started) and two pairs of socks. Depending on how things go in December, the socks may or may not make it in time, however I remain hopeful.